For Me to Poop On | Conversations between two dogs and their human. Conversations between two dogs and their human. Daria: I decided to remodel. I am going to completely remove this wall; it will really open up the place. Me: Why would you do this? Daria: I’m tired of having to push these annoying pet gates over, so I decided to just remove the wall. That way you can have your stupid pet gate, and I can still get into the room. Daria: Sounds like a win win to me. Me: Did you think that maybe I put the pet gates up for a reason? Loki: This time, actually, I’m completely innocent. Loki: Seriously, I can’t even reach that hole. Life has been busy, so Daria’s exercise schedule has been slipping a bit. This is *not* her fault; it is mine. 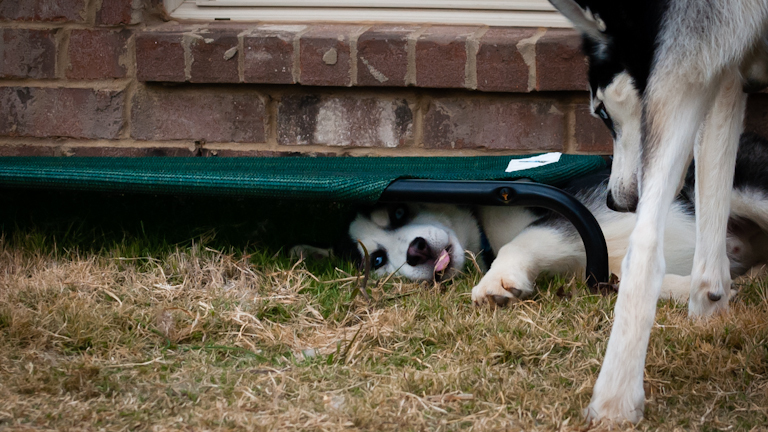 These are the consequences of having a bored Husky. Bikejoring Season is back, so she will be much more entertained soon. Daria: Hey! Where is Mine! Me: It is not like I planned to drop it. Daria: If you accidentally drop food for him, you have to accidentally drop food for me. Ne: How would it be accidentally dropping food if I plan it? She does this when she wants something. Stage one, I call this the “I’m asking nicely” stage, involves a head tilt. If she doesn’t get what she wants promptly she will let out an audible *huff*, stomp her foot, and put her head low with eyes that stare right through you. I call this the, “i’m not going to tell you again” stage. The third stage involves a loud *wooooooo* where she sings the songs of her people. My friend, who speaks fluent Russian, assures me that “I really don’t want to know what that means.” It is really hard to keep a straight face while she goes through this; It is quite hilarious, and cute. The photo is an older one, as I have yet to actually capture a photo of her in the act; it seemed appropriate. Me: That isn’t food, that is an entire herd of deer. Loki: An entire herd of food you mean. Loki: Just let go of the leash and I’ll kill us a few. Me: Like you could kill a deer. Loki: I’ve evolved from wolves. Loki: Trust me; I’ve got this. High prey drive doesn’t accurately describe Loki. Unfortunately for him the size of his prey drive doesn’t match his body weight. I think the deer herd was actually laughing at him before they ran off. Me: Good boy, three liver treats! Me: Again?! did you not just go three minutes ago? Me: Seriously? I get the feeling I am being taken for a ride. Kenai: Is it to get more treats? I’ll go drink more water meanwhile. Kenai (adopted) was a clever little dog. He was always pushing his boundaries. I have a method I use to house-train dogs where I start off by giving them treats every time they go to the restroom outside. The goal is to prevent accidents inside the house from ever occurring in the first place so I would take him outside a lot. It is critically important that you start phasing out the food rewards. Not completely, but you want to start treating less and less often. Kenai figured out quick that going to the bathroom outside would get him food rewards, so he would start to withhold some of his urine so he could cash it in for 3x as many treats. I would notice him going 3-4 times in rapid succession, coming back each time for a treat. I finished off his training by setting him up; I wanted to proof the behavior. When I came home from work one day I started playing with him instead of taking him immediately outside. He starts to go to the restroom, and I immediately non-mark him and drag him outside. Once he finished, he got his food reward. I don’t think I ever had anymore problems out of him regarding house training after that. The first goal in the urine for treats program is to teach the dog that going to the restroom outside around you is a worthwhile endeavor. This requires first and foremost that you be able to predict when your dog will Pee and Poop. Dogs usually will not urinate or defecate where they sleep, so a crate is great tool for this. To start with, I would crate Kenai for 30 minutes and immediately take him outside. If he went to the bathroom, he would get some liver treats and get to come inside to play for 15 minutes. If he didn’t go to the bathroom he would go back into the crate. 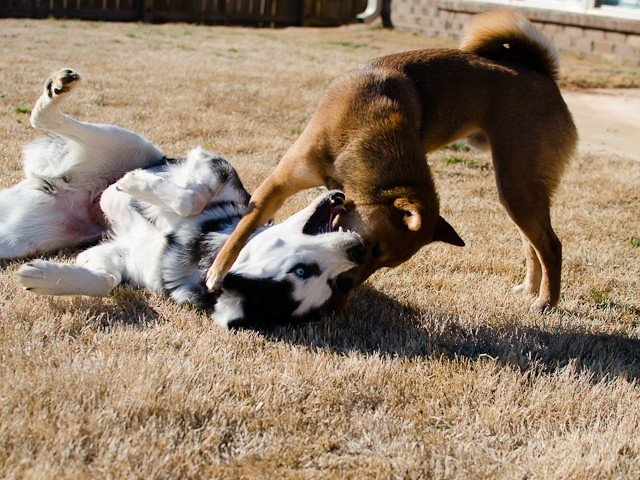 There is no reason to scream or shout at your puppy for any reason in this phase. If he makes a mistake here it is on you, not him. Imagine you are a little puppy, and you go to the restroom on this weirdly textured brown grass. Your owner is right there with you, so you think it is ok; you are safe. Immediately afterwards your owner starts screaming and shouting at you, and you do not know why. Later on you go to the bathroom when your owner is not looking, and nothing happens. Obviously going around your owner is problematic. It is easy for your dog to draw the wrong conclusions in this stage of training, completely misunderstanding why you are angry. When training you dog it is important that you be fair. Try to turn it into a fun game you both enjoy. If it is fun for you then you are more likely to keep up with training. If it is fun for him he is more likely to want to do it; you get better drive. The behavior I noticed from Kenai was exactly what I wanted. I wanted him to want to do this; it was a game for him. It was a game he was very good at winning. Me: Your dinner is still defrosting. Me: It will still be frozen solid! 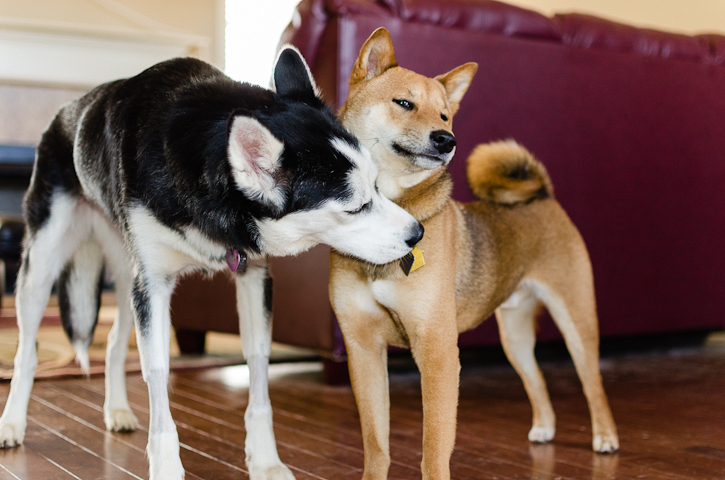 Yoshi: Weren’t you the one going on about how I needed better chew toys? Yoshi: Then I am totally confused. 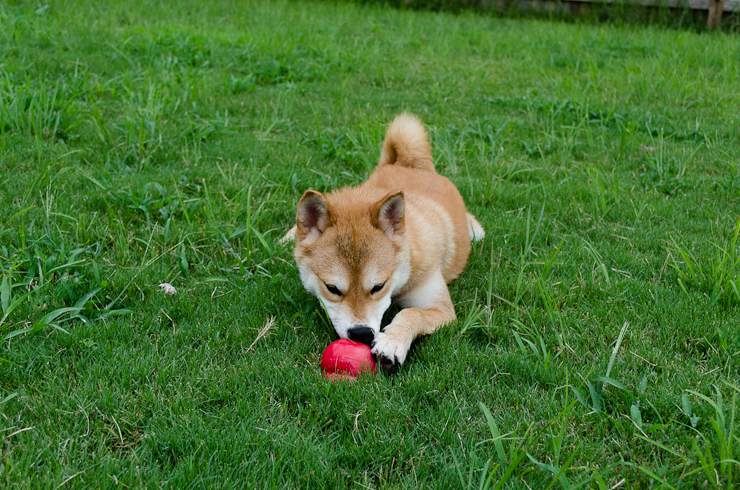 A frozen kong is an excellent way to help your dog with mild cases of separation anxiety, and general crate training. If you feed dry dog food, simply add some water to your dog’s dry kibble, stuff it into a kong, and leave it in the freezer overnight. When you crate your dog, toss the Kongcicle into the crate with him and he will be so focused on his kong he probably won’t even know you left. P.S. Yoshi was adopted by a nice family in Georgia. Best wishes to him in his new life. Loki: I successfully sniffed 100 Urine marked trees! Me: That is an accomplishment worth bragging about? Loki: Hey, it is better than the ones I see on your Xbox, who seriously brags about defeating a Lambent Berserker. What the heck is a Lambent Berserker? I took Loki and Daria to Monte-Sano this weekend for a 7.5 mile hike. It was not a difficult hike by any means, but it does serve to hi-light the differences in personality between Shiba Inu Loki, and Siberian Husky Daria. Daria just wants to go; she always has to be on the move. In fact, she honestly finds the trip more enjoyable if she has a back pack on (I have no idea why, but her tail seems to wag more). Loki, on the other hand, runs as far as he can forward, stops to sniff until I pass him, and repeats for the entire trip. Loki is just in it to sniff anything and everything (the more urine stained the better). Both dogs made it back home too exhausted to move (I think Daria might have sprained her Tail). Daria: Holy crap this is too exciting, we almost never go on walks in the morning, we have to go faster! Daria: No time for that, we have to get as much walking in as possible before you go to work! Me: You know better than this, you were trained to walk on a loose leash. Daria: Wait … that applies in the morning time as well? One of the most important lessons in training dogs that I ever had to learn is that dogs don’t necessarily generalize ideas and concepts as well as humans do. 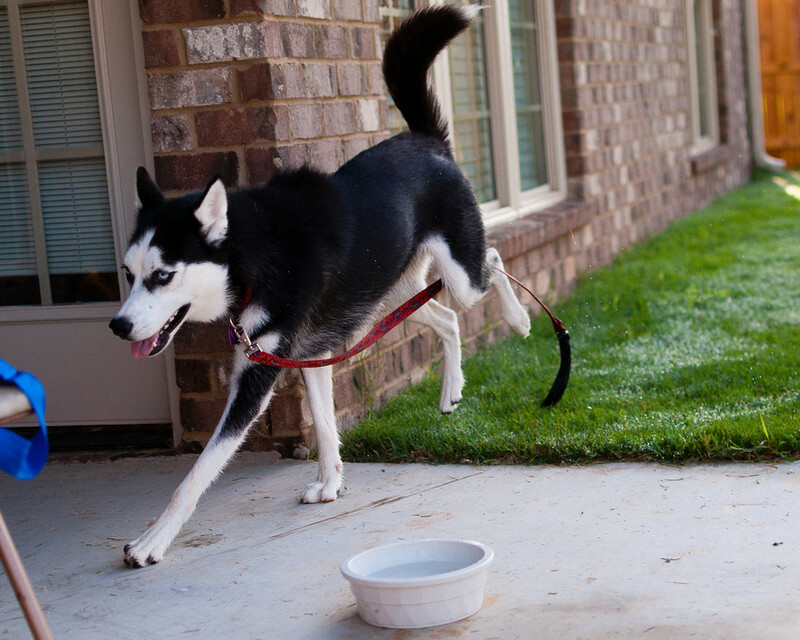 Just because your dog is trained to walk on a loose leash at home, doesn’t mean she will at the park, or at the President of the Siberian Husky Rescue’s house. Once you have the behavior trained in a specific case, you have to then retrain the dog in a variety of other cases. You have to let them know that the expected behavior applies when they are at the park, during morning time, or even at the home of one of her favorite people. If you expose the dog to enough distractions in a large enough variety of situations and circumstances then you will have a much more reliable behavior.